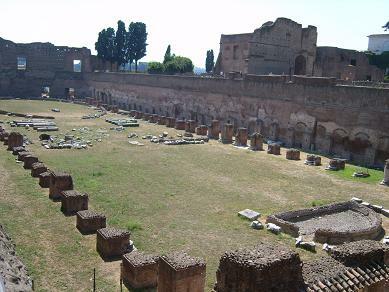 Next to the Colosseum and the Forum, is the Palatine Hill. According to the legends, the city of Rome was founded here in 753 BC. It contains relics from ancient times, including the Palace of Septimus Severus, the House of Augustus and the House of Livia. The picture on the left shows the the imperial palace on the Palatine. 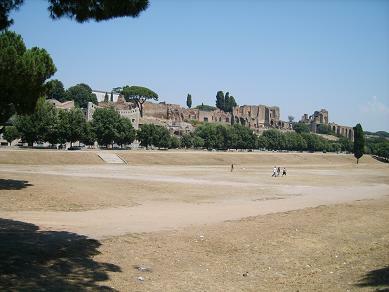 Circo Massimo, once an huge arena for chariot racing, is the open area. A combined ticket (Colosseum + Palatine + Forum) cost €12 and is valid for two days. The reservation fee is €2/ticket.The reduction price is €7.50. When we were there (in the afternoon), there were long queues in the Colosseum for the ticket windows. In the Palatine was hardly a waiting time. In the Colosseum are up to 3.000 visitors allowed. The most easy way is to buy your tickets online. European and non-european people under 18 have free admission. An ID-card or passport is required. The nearest metro station is: “Colosseo”.